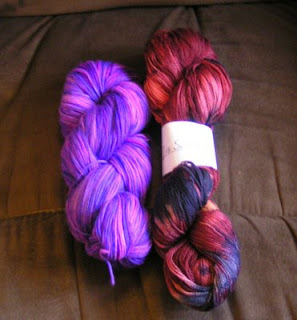 First is the gift I got from Jenny for Christmas - a skein from Lisa Souza and a skein of handdyed. I know the purple will be some sort of armwarmers but I haven't found the right pattern yet. The LS will most likely be a scarf or stole. Next is some that I ordered early last month but just got on Friday. It's from Handgefaerbt (link at right) in Germany. 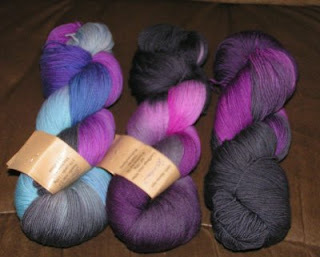 The purpley skeins are called Minotaur - one is sock weight and the other is laceweight - and the blue is called Basilisk. She names all of her work after fantasy characters. You must check her out. That's all for now. Happy New Year!